This case describes a recently completed project that improves the Landing Signal Officer�s (LSO) decision making when guiding the landing of aircraft on aircraft carriers. The real-time decision support aids were developed using multiple Artificial Intelligence (AI) techniques. The project developed pilot trending and flight prediction techniques as well as optimized the LSO�s user interface via the application of decision-centered design methodologies from cognitive psychology. Stottler Henke Associates, Inc. (SHAI) staff determined the significant aircraft approach parameters and developed a neuro-fuzzy system for plane trajectory prediction. SHAI (www.shai.com) also developed pilot trending techniques and software using case-based reasoning and fuzzy logic. In addition, in conjunction with many LSOs, staff determined the best display options and most appropriate display logic for the information produced by the pilot trending module, and designed and implemented the resulting LSO interface called PADAL -- Piloted Approach Decision Aid Logic. The aircraft carrier landing environment is an extremely complex one. In addition to operating what may be termed as an extremely busy airport, aircraft carrier landing operations are affected by a number of variables not associated with a normal airport. Of these, the most critical are fleet tactical considerations, flight deck space constraints, aircraft carrier maneuvering space (sea room), flight deck motion (pitch and roll), continuous mechanical preparations, resetting arresting gear and optical landing system between each landing, airborne aircraft fuel status, aircraft ordinance, minimal use of navigation, communications and RADAR emissions as in EMCON operations; and, above all, time constraints. The Landing Signal Officer (LSO) is responsible for each aircraft�s final approach and landing. During the last 60 seconds, the cognitive demands, namely the critical decisions and judgments, increase quickly until a decision to wave off (i.e., abort landing), or not, is made. The LSO, and not the pilot makes the wave-off decision. Often times the ship is heaving 10 ft. up and 10 ft. down, making a 20 ft. displacement from a level deck. In addition, it is often difficult to see the aircraft approach during night operations, and impossible to see during stormy conditions at night. 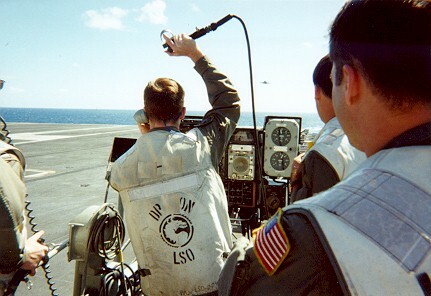 Landing Signal Officers (LSOs) aboard carriers rely on auditory cues and the equipment at the LSO station to monitor each landing, communicate flight adjustments via radio to the pilot, and decide whether or not to wave off (e.g., abort the landing). This difficult and time-critical task requires the LSO to consider the flight path, wind conditions, ship motion, as well as the type of aircraft. For the project described in this case, Stottler Henke Associates, Inc. (SHAI) staff were tasked with designing a decision support tool to enhance the LSO station, in order to assist LSO decision-making and hopefully increase the amount of time to make a correct wave-off decision, which is usually from 0.5 to 4 seconds before landing. One of the challenges encountered was that inferences needed to be drawn based on correlations between a data source in linguistic form and a numeric data source. Another major challenge was aircraft motion prediction. Essentially the problem is that of time series prediction in which past and present motion profiles are presented to the prediction system and it is required to predict the motion in the next few seconds. 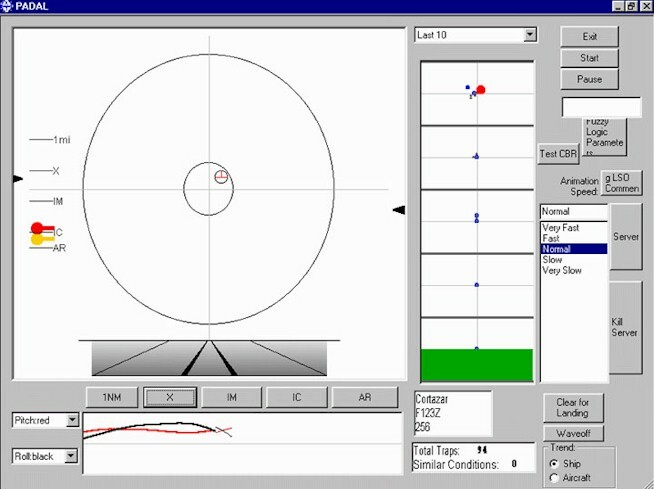 The system can be trained with past data before it is engaged in the on-line prediction task. Stottler Henke teamed with Klein Associates to design an innovative visual display used by backup LSOs, to improve the performance of LSOs. This display called Piloted Approach Decision Aid Logic (PADAL) used strobing to present the current and recent positions of the aircraft relative to the ideal flight path, distance from the carrier, recent ship motion, and other relevant data. The system also uses neural networks to predict the aircraft's position into the future. A fuzzy logic based approach is used to infer the correlation of landing data in linguistic and numeric formats, where both data sources are characterized by noisy and incomplete data. By correlating the numerical motion trajectories with the previous grading of related aircraft approaches in a linguistic database, similar approach information is presented to facilitate decision-making. According to Robert Richards' paper on this project, a "neural network based fuzzy inference system  approach for time-series prediction was determined to be the most successful approach for solving the aircraft motion prediction challenge. Many techniques were considered and tested including statistical , adaptive signal processing , and other transform and machine learning  techniques. A database of landing trajectories of different pilots flying various aircraft was used to train the system for subsequent prediction purposes. The goal was a projection 2 seconds ahead of the current flight position." Existing Navy databases store trajectory descriptions in two formats: landing signal officers� linguistic comments describing the previously executed landing approaches and numerical RADAR data, which provides information about the current landing trajectory. Numeric RADAR data is not stored for all landings, so only the linguistic comments are available for the majority of past landings. Each landing approach is subdivided into 5 stages based on the aircraft�s distance from the ship�s deck; these stages describe how far away the landing aircraft is from the deck. LSOs� comments are recorded in a special shorthand code, which describes various aspects of the pilot�s approach for each landing stage. When a plane is attempting to land on an aircraft carrier, the landing signal officer�s comment describing the pilot�s performance is not yet available to the decision-support system described in this case. However, the ship�s RADAR constantly monitors the pilot�s progress and relays the numerical aircraft position data to the decision-support system. This motion profile provides the basis for analysis of the current landing trajectory and allows for its comparison with previously executed landings. Fuzzy logic is employed to perform numeric-to-linguistic conversion in order to ensure a homogeneous data format necessary for information fusion. The landing trajectory is represented as deviations from perfect lineup (i.e., side-to-side) and perfect glideslope (i.e., height). Fuzzy lineup and glideslope functions were determined from analysis of Navy data. These fuzzy concepts enable the system to classify any point in the landing trajectory by associating fuzzy membership values with it. The system used case-based reasoning  to retrieve previously stored linguistic cases most closely resembling the current landing trajectory by computing a similarity measure of the current numeric trajectory with respect to each stored linguistic comment. The data fusion using fuzzy logic is used as part of the similarity measure calculation. Similarity measure is computed online every time the approaching aircraft passes the next landing stage. Each time a similarity measure is recomputed, exponential forgetting is used to assign higher weight to the most recent stage of the landing. A neural network based fuzzy inference system  is a multi-layer network in which each node performs a particular function (e.g., a fuzzy function) on incoming signals (as well as a set of parameters pertaining to the node). The nature of the node function may vary from node to node, and the choice of each node function depends on the overall inputoutput function, which the neural network is required to carry out. A neural network has two types of nodes: an adaptive node has parameters that may be updated by a learning algorithm, while a fixed node has none. The system was trained with a subset of the past (noisy) RADAR data before it was engaged in the on-line prediction task. After training the system with a subset of the past profiles, the system was exposed to unforeseen approaches and forecast its profile in the next few seconds on-line. To guide an aircraft to land more safely and smoothly aboard aircraft carriers, LSOs need the ability to predict how the aircraft motion trajectory will continue. This ability is mainly learned via experience and the fact that all LSOs are themselves pilots. However, SHAI was tasked with attempting to develop a system to predict the plane position 2 seconds hence. This task consisted of solving a time series prediction problem in which past and present motion profiles are provided to the prediction system in order to predict the motion in the next few seconds. No other information was provided to base the prediction on, such as present engine setting or wind speed and direction. Typically, the flight pattern is carefully observed and guided when the aircraft is within one nautical mile (1 NM) of the landing deck in open sea. This corresponds to approximately one minute in real flight time. A RADAR system records numeric aircraft trajectory information. This data was used to train a system for subsequent prediction purposes. Thus the general problem was to take as input, time-series profiles with a maximum duration of about 1 minute and provide a 2 second hence prediction of the plane�s location. The screen designs developed during this project have been implemented for the Visual Imaging Systems for Approach & Landing (VISUAL) Prototype developed by the Naval Air Warfare Center / Naval Aviation Systems and form the basis for the full-scale development of the next generation of LSO workstations. PADAL is a U.S. Navy SBIR Success Story. There should be at least two important results from this project. First, the fleet will realize increased safety and expediency in the recovery of aircraft though the use of an intelligent PADAL System to aid the natural decision making processes of the LSO in a time critical environment. The proposed techniques will promote increased safety, while still maintaining a maximum safe rate of aircraft recovery. Second, significant advancements will be made in three key areas-trajectory prediction, Case Based Reasoning (CBR) and advanced motion case display technology. Pao, Yoh-Han, Adaptive Pattern Recognition and Neural Networks, Addison-Wesley, 1989. Pao, Neil A., Introductory Statistics 5th Edition, Addison Wesley, 1999. Widrow, Bernard, and Samuel D. Stearns, Adaptive Signal Processing; Prentice Hall, 1985. Mitchell, Thomas M., Machine Learning, McGraw-Hill, 1997. Kolodner, Janet, Case-Based Reasoning, Morgan Kaufman, 1993. Jang, Jyh-Shing Roger , Chuen-Tsai Sun, and Eiji Mizutani, Neuro- Fuzzy and Soft Computing: A Computational Approach to Learning and Machine Intelligence, Prentice Hall, 1996. Much of the material in this case is from Richards, R. A. "Application of Multiple Artificial Intelligence Techniques for an Aircraft Carrier Landing Decision Support Tool", IEEE 2002 World Congress on Computational Intelligence, http://www.stottlerhenke.com/papers/WCCI_2002_Richards.pdf . About Stottler Henke Associates, Inc. Founded in 1988, Stottler Henke Associates, Inc. applies artificial intelligence and other advanced software technologies to solve problems that defy solution using traditional approaches. The company delivers intelligent software solutions for education and training, planning and scheduling, knowledge management and discovery, decision support, and software development. Stottler Henke's clients include manufacturers, retailers, educational media companies and government agencies. The Web URL is www.stottlerhenke.com. What is the purpose of PADAL? Is PADAL a knowledge-driven Decision Support System? Why or why not? Who is the intended user of PADAL? What is the major benefit of this application to decision makers? other users? Why? Stottler Henke Associates Staff, "PADAL helps US Navy aircraft land aboard carriers", January 15, 2005 at URL DSSResources.COM. Jim Ong, Stottler Henke Associates, provided permission to use this case study and screen shots at DSSResources.COM on December 22, 2004. This case study was posted at DSSResources.COM on Saturday, January 15, 2005.